The contribution of Ukrainian scientists to the development of quantum physics has been analyzed, and a classification in accordance with corresponding branches has been made. The importance of researches in this physical domain is demonstrated. The priority of Ukrainian scientists in a number of scientific issues in the world science is shown. Attention is paid not only to the scientific activity of physicists, but also to their pedagogical and educational works. The importance of current researches carried out by Ukrainian scientists is demonstrated. R. Avgustyn. Physicists of Ukrainian Diaspora in the World Science (Aston, 2002) (in Ukrainian). Axioms for Posterity: Ukrainian Names in the World Science. Edited by O.K. Romanchuk (Kamenyar, 1991) (in Ukrainian). Axioms for Posterity: Ukrainian Names in the World Science. Edited by O.K. Romanchuk (Memorial, 1992) (in Ukrainian). B.M. Andrianov. Essays in the History of Physics Development in Ukraine (VDPI, 1995) (in Ukrainian). Elucidation of Ukrainian Physicists' Achievements in the Physics Course. Edited by I.R. Zachek, I.Ye Lopatyns'kyi, Y.Ya. Khrom'yak (DULP, 1999) (in Ukrainian). M.V. Golovko. Application of Materials on the History of Domestic Science while Studying Physics and Astronomy ("International financial agency" Ltd., 1998) (in Ukrainian). Yu. Ranyuk. Laboratory No. 1. Nuclear Physics in Ukraine (Akta, 2006) (in Ukrainian). Yu.A. Khramov. History of Formation and Development of Physical Schools in Ukraine (Feniks, 1991) (in Russian). V.A. Shenderovs'kyi. Let the Light of Science Not Die Away. Edited by E. Babchuk (Prostir Publ. House, 2009) (in Ukrainian). M.V. Golovko. Domestic physics and astronomy in the last millennium. Fiz. Astronom. Shkoli 2, 49 (2001) (in Ukrainian). A.G. Shepelev. 75 years of the discovery of type-II superconductivity (Shubnikov phase). Ukr. J. Phys. 56, 955 (2011). V.G. Litovchenko. My scientific contacts with V.E. Lashkarev. Ukr. J. Phys. 59, 826 (2014). M.V. Strikha. The centennial of semiconductor science: origins and Ukrainian contribution. Ukr. J. Phys. 59, 831 (2014). V.A. Sokolov. To the history of blackbody radiation law (About V.A. Mikhelson's researches). Usp. Fiz. Nauk 43, 275 (1951) (in Russian). D.I. Polishchuk. Kirillov Elpidifor Anempodystovych [http://fs.onu.edu.ua/clients/client11/web11/litopis/Kirilov.pdf] (in Ukrainian). Encyclopedia of Modern Ukraine [http://esu.com.ua/search_articles.php?id=6349] (in Ukrainian). O. Dovhyj. The Stasiw–Teltow's model in classical photographic theory. Ukr. J. Phys. 47, 1099 (2002). O. Stasiw, J. Teltow. Zur Photochemie der Silberhalogenide mit Fremdionenzusatzen. Ann. Physik. 432, 181 (1941). O. Stasiw, J. Teltow. Z. wiss. Photogr. 40, 157 (1941). V.E. Lashkaryov Institute of Semiconductor Physics of the National Academy of Sciences of Ukraine [https://isp.kiev.ua/images/Page_Image/History/50_years_institute/44.pdf]. V.P. Linnyk, V.E. Lashkaryov. Methods of X-ray focusing. Ukr. Fiz. Zap. 1, No. 1, 5 (1926) (in Ukrainian). V.P. Linnyk, V.E. Lashkaryov. Determination of the refractive index for X-rays using the total reflection phenomenon. Ukr. Fiz. Zap. 1, No. 2, 3 (1927) (in Ukrainian). V.E. Lashkaryov. Appearance of photo-electromotive forces in semiconductors. Zh. Eksp. Teor. Fiz. ` 18, 917 (1948) (in Russian). V.E. Lashkaryov Institute of Semiconductor Physics of the National Academy of Sciences of Ukraine [https://isp.kiev.ua/images/Page_Image/History/50_years_institute/279.pdf]. In Memory of Anatolii Petrovych Gorban' (1938–2009). Ukr. J. Phys. 55, 356 (2010). B. Lazaryuk. In the shadow of the own discovery aureola [http://gazeta.dt.ua/SCIENCE/u_tini_syayva_vlasnogo_vidkrittya.html] (in Ukrainian). J. Puluj. Uber die entstehung der R¨ontgen'schen Strahlenund ihre photographische Wirkung. Wiener Berichte 105, 228 (1896). Site of physics teachers of Vinnytsya Technical Lyceum [http://vtl.vn.ua/fiziki/fizukr/f_u_pyl.html] (in Ukrainian). N.D. Pilchikov. Radium and its rays. Vestn. Opytn. Fiz. Elem. Matem. 286, 217 (1900) (in Russian). N.D. Pilchikov. Properties of radium rays. Vestn. Opytn. Fiz. Elem. Matem. 289, 3 (1900) (in Russian). Chair of Theoretical Physics of the Taras Shevchenko National University of Kyiv [http://theory.phys.univ.kiev.ua/uk/content/kordysh-leon-yosypovych]. L.Ya. Shtrum. Leon Iosifovich Kordysh [Obituary]. Usp. Fiz. Nauk 13, 970 (1933) (in Russian). O.A. Shcherbak. 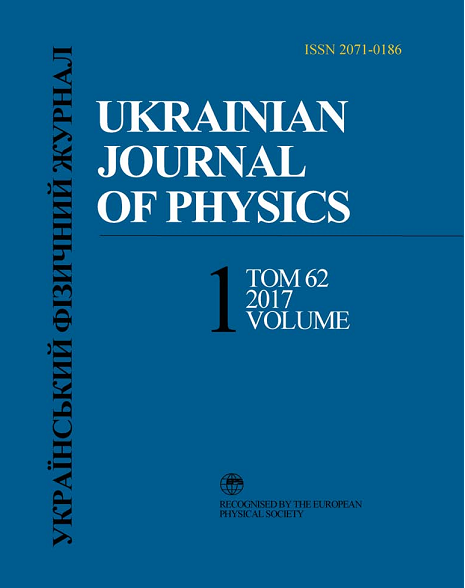 Development and interpretation of quantum concepts in Ukraine. Pytan. Istor. Nauky Tekhn. 1, 2 (2009) (in Ukrainian). V.I. Vernadsky National Library of Ukraine [http://www.nbuv.gov.ua/node/2263]. Ukrainians in the World [http://www.ukrainiansworld.org.ua/peoples/f9d3a671b01673e1/]. D. Iwanenko. The neutron hypothesis. Nature 129, 798 (1932). G. Gamow, D. Iwanenko. Zur wellentheorie der materie. Z. Phys. 39, 865 (1926). V. Ambarzumian, D. Iwanenko, Compt. Rend. Acad. Sci. 190, 582 (1930). E. Gapon, D. Iwanenko. Zur Bestimmung der isotopenzahl. Die Naturwissenschaften 20, 792 (1932). D. Iwanenko, A. Sokolow. On the mathematical formalism of the theory of showers. Phys. Rev. 53, 910 (1938). Chair of Nuclear and Medical Physics [http://wwwhtuni.univer.kharkov.ua/ftf/pht/kaf/keyaf.htm]. A. Tan'shina. Life devoted to science. Ilya Ivanovych Zalyubovs'kyi (15.06.1929-21.02.2013). Ukr. J. Phys. 58, 800 (2013). Encyclopedia of Modern Ukraine [http://esu.com.ua/search_articles.php?id=27660]. Yevgen Dmytrovych Volkov (03.03.1934–16.01.2012). Ukr. J. Phys. 57, 584 (2012). I.M. Mikhailovskii, E.V. Sadanov, T.I. Mazilova, V.A. Ksenofontov, O.A. Velikodnaya. New possibilities of electron microscopy: ultra-high resolution and observation of atomic orbitals in carbon monoatomic chains. In Proceedings of the 9th International Conference on Physical Phenomena in Solids (Kharkiv, 2009) (in Russian). G. Gamow. Essay on the development of the theory of atomic nucleus structure. The theory of radioactive decay. Usp. Fiz. Nauk 10, 531 (1930) (in Russian). G. Gamow. Zeit. f. Phys. 210, 51 (1928). B.A. Brown. Simple relation for alpha decay half-lives. Phys. Rev. C 46, 811 (1992). G. Gamow. Half an hour of creation... Phys. Today 3, No. 8, 16 (1950). B. Odarchenko. Georges Charpak, a Nobel laureate from Polissta Dubrovytsya [http://www.radiosvoboda.org/content/article/24559081.html] (in Ukrainian). Gennadii Fedorovich Filippov (to the 80th anniversary of his birthday). Ukr. J. Phys. 57, 684 (2012). M.M. Bogolyubov Institute for Theoretical Physics [http://www.bitp.kiev.ua/san.htm]. The Higher School Academy of Sciences of Ukraine [http://anvsu.org.ua/index.files/Biographies/Khimich.htm]. To the 75-th anniversary of the Doctor of science in physics and mathematics, Professor of Uzhgorod National University Ivan Vasylyovych Khimich. Ukr. J. Phys. 55, 745 (2010).